It's a minor refresh, but a refresh nonetheless. If you'll recall, we saw the original Joker Neoprene Face Mask in that Batman Movie, and now that we're 3.5 years in the future, the Trickster Neoprene Face Mask is making its debut for those who crave "clowning" around. Judging from the interior, little has changed from then until now, but the revamped exterior may be of interest -- there's a lot of lipstick on this mask...kind of like Courtney Love. Neoprene face mask features full coverage of the face and ears. Stretchy neoprene material is warm and water resistant. Lined with black stretch nylon trim. Patterns are reversible to solid black material. Velcro closure ensures great fit with goggles, with a helmet or without. One size fits most. Trickster Design. 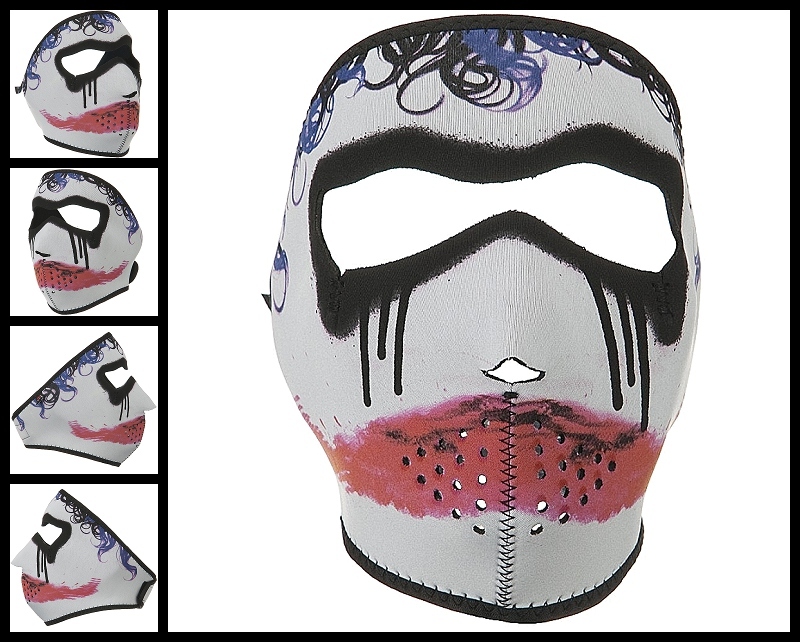 These face masks are commonly used for motorcycle riding, bicycling in rough terrain, Courtney Love concerts, airsoft guns, paintball, skiing, hunting, and winter apparel.